One really needs to drink well in Florence. The magnificence of Florentine art can be so overpowering that aesthetic ‘overload’ can set in. Then some really good wine is necessary to recharge the batteries. And I know the perfect place to find such sustenance. 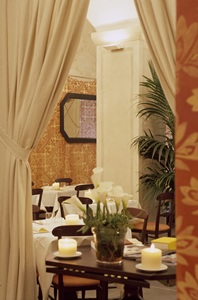 It has a magic name: Frescobaldi. This ancient and noble family produces some of the very best wines in Italy. Indeed, those who love their wine can be confident that even the cheaper wines produced by the Frescobaldi wineries will be good examples of their type. 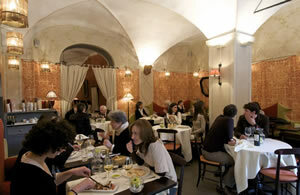 I was therefore delighted by the prospect of visiting the Frescobaldi Restaurant in Florence. And its location, on one corner of the famous Piazza della Signoria (home of Michelangelo’s statue of David – or, at least, the copy which stays out in the weather), only served to heighten my anticipation. 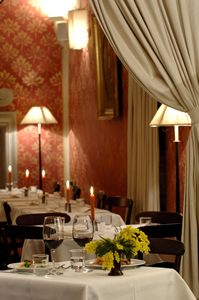 I arrived to find a smart dining room, decorated in a welcoming modern manner, with bright lights and red banquettes, staffed by friendly young ladies and managed with the utmost courtesy, efficiency and enthusiasm by Mr Francesco Carzoli. Of course, my immediate concern was of the oenological kind. 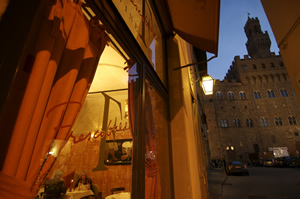 How could it not be in a restaurant named Frescobaldi? I found, as I had hoped, that the wine list was a paean of praise to the family’s products. And, also as I had hoped, the prices are conspicuously friendly – starting at around 15€ and going up to 1,250€ for a double magnum of 2007 Ornellaia. Even Masseto, a wonderful wine which usually goes for astronomical prices (following the awarding to it of 100 points out of 100 by the influential Mr Parker), was a very tempting 725€ for a bottle of its 2009 vintage. Into the good Spiegelau glass I had poured another of those red ‘super-Tuscans’ about which everyone raves. This, too, was from the 2009 vintage. And what a gem this was. I first met Luce some years ago. Its bottle alone, with surely the most splendid label ever produced (of the name within a golden monstrance, against a dark background) was enough to seduce me. Then I tasted the contents. I have been a devoted fan ever since. Indeed, I have drunk various vintages, and never yet have I encountered the slightest disappointment. Certainly, the liquid from this 2009 vintage was as beautiful as a Puccini aria – rich, caressing and profound. Dense and deep, with its elegant nobility enhanced by a captivating residual sweetness, it spoke of ripe damsons, intense chocolate and ancient leather. This bottle reminded me that to linger over wine of such quality is one of life’s great pleasures. And here it is just 155€ a bottle. 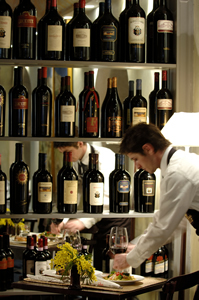 When you want to drink well in Florence – no, when you want to drink wonderfully in Florence – and you want some good food with your wonderful wine, make your way to the Ristorante dei Frescobaldi. Salute! Via dei Magazzini 2-4/R, 50122 Florence, Italy.